Fraser Watts reviews Stephen Verney’s posthumous publication. 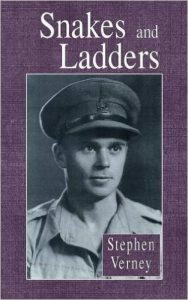 I have been reading a posthumous book (Snakes and Ladders) by Stephen Verney. He was probably the most important spiritual mentor in my life, and I had great affection and respect for him. Like all his other books, this one is beautifully written. The prose is clear and powerful, and his glorious integrity shines through every sentence. It is hard to say what kind of book it is. It is part autobiography, and part theological reflection on the reconciliation of opposites. Perhaps it is ‘theology through autobiography’ (a genre pioneered by St Augustine in his Confessions). After a brief chapter on his childhood, the book is divided between his formative wartime experiences and his subsequent Christian ministry. In many ways, the wartime section is the most powerful, as it is where Stephen grapples with the dilemma of whether to be a pacifist or to fight. His time in the war was divided between a pacifist in the Friend’s Ambulance Corp and then, after a change of heart, playing a heroic role in the resistance in Crete. It was in the war that Stephen grappled with how to reconcile power and powerlessness, how to overcome ‘us’ and ‘them’, how to reconcile having a strong ego with the need to let ego go. His wartime struggles with these issues shaped him for life and made him the inspirational spiritual leader that he was. Bringing this book eventually to publication has not been an easy task for his widow, Sandra. Stephen had left numerous versions behind, and never quite resolved what he wanted to say about certain key issues. Everyone who loved Stephen and has been inspired by him has much reason to be grateful to her. I remember a conversation with Stephen when he told me he was writing this book. I asked what it was about. He said, “it is about the glory of God”, in a tone of voice that implied he was writing about something so racy and daring that it was almost unmentionable. But this is not abstract theology. Stephen always spoke and wrote about things that he knew about from experience, and knew to be true. It was the depth of the personal struggles he had gone through that gave his wisdom such power. In this book, the experiential roots of his insights are clearer than ever. In one of the many earlier versions of this book there was a reflection on how Moses saw God’s backside as he passed by (Exodus 33:18-23). The point was that we often don’t see God clearly at the time but, as we look back, we can see how the glory of God has passed by. That is what Stephen does here. He would be delighted if others took this book as a model of how to reflect on their own lives in a way than enabled them to see God’s backside, and how he had passed by them.